To create a settlement flowchart, programs designed specifically for flowcharting purpose are particularly well-suited to the task. Edraw can automatically create settlement process flow you choose, adds flow lines, and aligns the symbols, And your flowcharts can be shared with anyone who uses PDF, Microsoft Word, Excel or PowerPoint. 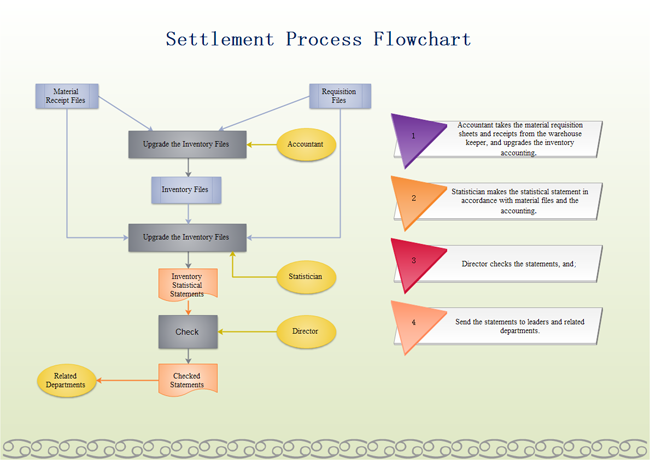 The following settlement flowchart is an example in Edraw which shows the basic monthly settlement steps. (4) Send the statements to leaders and related departments.